No needle and thread? No problem! 1. Turn a tee in to a cardigan by cutting down the middle and using hem tape to create straight sides. 2. You'll love this no-sew infinity scarf times infinity. 3. Using stitch adhesive and a rivet kit, you can create this cute as heck DIY tote. 4. Who doesn't love a colorful bowtie? Make one with a glue gun following these easy instructions. 5. Fashion a cute dress from an oversized skirt? Yes please! 6. How cute is this clutch? And there's no needle and thread involved. 7. These adorable bows can be added with just a bit of glue. 8. Wear your heart on your sleeve with this no-sew project. 9. Try this cool lattice tee look. 10. Make the daintiest of baby bows. 11. Sleep easy in this super simple pillow case skirt. 12. Make this sweet apron with iron-on hem and a couple of your favorite scarves. 13. 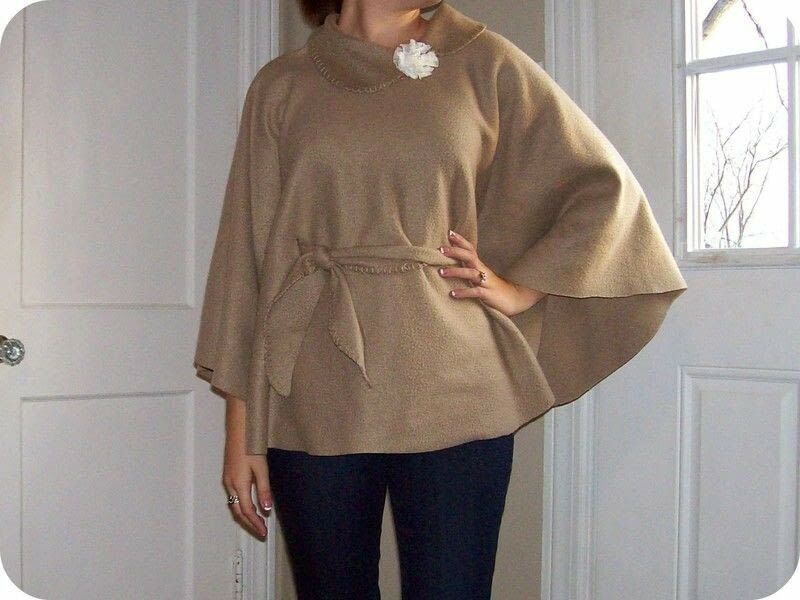 This darling flutter cape can be made with just two pieces of fleece. 15. Make a neat multi-strand necklace out of an old tee. 16. Add a cute pocket to your favorite white tee. It'll only take ten minutes, we promise. 17. This circle skirt gathers nicely at the waist. 18. The secret to this skirt is all in the wrap. 19. Create a cute headband out of an old tee. 20. Create super cute scalloped shorts with just scissors and fabric pen. 22. This DIY halter cover up is chic enough to wear on the boardwalk and the beach. 23. Basic tees are so boring. Fancy yours up a bit with this easy DIY. 24. Got an oversized man's shirt lying around? Turn it into a skirt. No cutting or sewing required. 26. Add a cool lace insert into your shirt with just a bit of hem tape. 27. This open-back tank top just requires scissors and fabric glue. 28. Add a peplum to your favorite skirt for a totally new look. All you need is a glue gun! Get the instructions here. 29. Cut a cute crop top with a couple of easy snips. 30. Turn an ordinary tank into a fun fringe look. 31. Headed to the beach? Bring a no-sew tote! 32. And while you're there, wear this cute beach-ready cover-up fashioned from an oversized tee. 33. Or give this no-sew swimsuit cover-up a try. 34. This skirt requires no sewing and gets its cool design from an oatmeal cannister. How cool is that? Get full instructions here. 35. Turn a plain button-down into a cute on-trend look. 36. Add some pizzazz to your pants with studded cuffs. 37. Add a lacy element to a plain tank, no sewing required. 38. Add a shiny collar to your boring blouse with old CDs. 39. Velcro makes this open-back sweater super-easy to operate. 40. This peter pan collar is the perfect addition to any outfit. 41. Create cute lace shorts without sewing a stitch.